1 C 120 Private, Dunlap, William B 170 N Guards. July 28, 1864 Removed from Frederick.
" " 147 " Dye, James I 194 Infantry, Mar. 30, 1865 "
" E 235 " Dunn, John 23 " Removed from South Mountain.
" " 238 " Dixon, Robert A. I 23 " Sep. 15, 1862 "
" " 241 " Daley, Andrew J. K 36 " Sep. 14, 1862 "
" " 251 Corporal, Debretz, Michael K 11 " Sept.14, 1862 "
" " 261 Private, D----, J. H. 11 " "
" " 263 " Detrick, George D 5 " "
" F 284 " Davis, George H. B 23 " Aug. 10, 1864 Removed from Middletown.
" " 290 " Davis, Miles H. C 116 " Oct. 12, 1864 Removed from Weverton.
" " 301 " Dierkies, Charles E 116 " Sep. 25, 1864 "
" " 302 " Dunn, Calvin D 123 " Sep. 22, 1864 "
" " 305 " Donovon, William K 126 " Sept.15, 1864 "
" A 14 " Erskine, Lewis D 23 " Mar. 13, 1865 Removed from Clarysville.
" 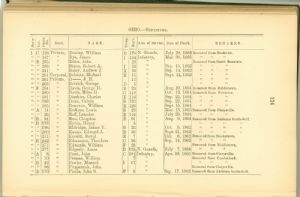 " 26 " Eoff, Leander E 116 " July 28, 1864 "
" B 94 " Eno, Cleophas B 91 " Aug. 9, 1864 Removed from Antietam battle-field.
" D 178 " Eyton, Henry 5 " "
" " 196 " Eldridge, James V. D 23 " Oct. 5, 1862 "
" " 200 " Ewens, Edward J. D 30 " Sept. 21,1862 "
" " 211 " Everitt, David E 7 " Oct. 6, 1862 Removed from Smoketown.
" E 242 " Edmunson, Theodore C 36 " Sep. 14, 1862 "
" " 277 " Edgerly, Amos D 135 N. Guards, July 7, 1864 "
" A 8 " Forst, John C 191 Infantry, Apr. 19, 1865 Removed from Clarysville.
" " 10 " Fremas, William 7 " Removed from Cumberland.
" B 49 " Fowler, Manuel I 67 " "
" " 96 " Fitzpatrick, John " Removed from Clarysville.
" D 170 " Fields, John S. F 8 " Sep. 17,1862 Removed from Antietam battle-field.